Along with City DPRD's Banggar, the TAPD began to discuss the 2018 APBD Amendemnt's Priorities and the Tentative Budget Platform (KUA-PPAS).
" 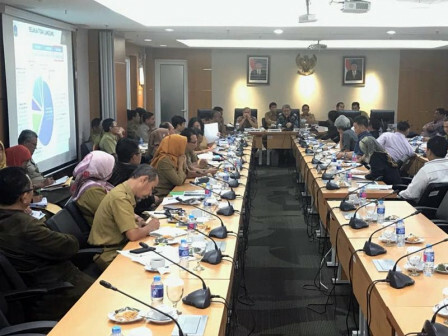 There is a surge of determination by 77.1 trillion, precisely at Rp 83.2 trillion"
On that occasion, TAPD Chairman, Saefullah conveyed that the APBD Amendment's KUA-PPAS proposal is reaching Rp 83.2 trillion or an increase of Rp 6.1 trillion compared to this year's APBD by Rp 77.1 trillion. "There is a surge of determination by 77.1 trillion, precisely at Rp 83.2 trillion," he expressed, at City Council building, Tuesday (8/28). He explained that it happened because of a shift in a number of budget posts. Each of the local revenue posts in this year APBD was set at Rp 66.029 trillion or has decreased of 0.33 percent to Rp 65.809 trillion. Similar thing is also spotted at the expenditure post by 0.48 percent from Rp 71.169 trillion to Rp 71.513 trillion and financing receipt post that also experienced an increase of 57.41 percent from Rp 11.087 trillion to Rp 17.452 trillion. It also happens in financing expenditure post from Rp.5.947 trillion to Rp11.749 trillion or 97.54 percent. He assessed that a shift in a number of budget posts was in accordance with the gubernatorial regulation number 70/ 2018 on amendments over gubernatorial regulation number 198/2017 on elaboration of the revenue budget and local expenditures in 2018. "In local expenditures, a shift takes place in advance of the APBD amendment, namely the unexpected expenditures to support the Asian Games and PJLP salary fulfillment at the Environment Dept.," he told. Saefullah acknowledged that he is ready to take part in the follow up discussion meeting of the 2018 APBD Amendment's KUA-PPAS at the commission level at the meeting that will be led by City DPRD's Banggar Vice Chairman, Triwisaksana. "And I will also monitor this discussion at the commissions thus I know more about the direction and intentions of the council members before becoming a revised APBD," he said.